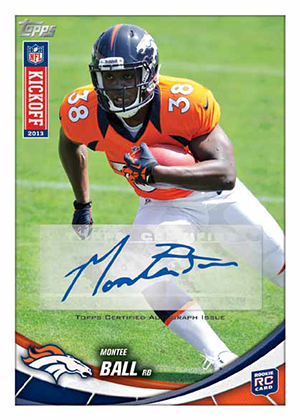 Topps has announced details for the 2013 Topps NFL Kickoff program. It gives collectors an incentive to to head to their local hobby shops between September 5 and 10 -- free exclusive bonus cards. 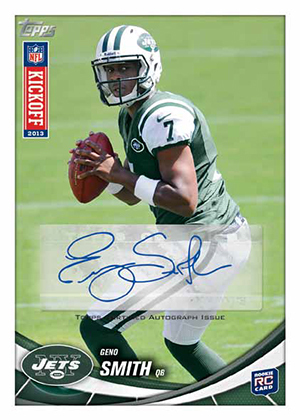 During that week, those that buy 18 packs of 2013 Topps Football from a participating shop will receive a special pack of 2013 Topps NFL Kickoff cards. The set includes 50 cards. The checklist mixes rookies, veterans and retired greats. 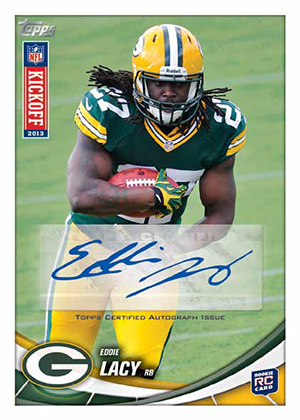 Randomly inserted in 2013 Topps NFL Kickoff packs are autographs. 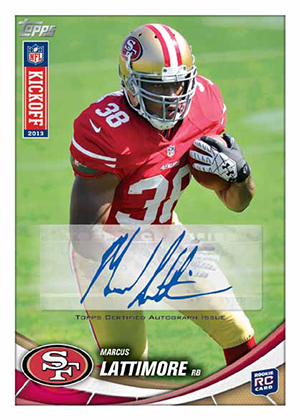 There are also a few Golden Ticket redemptions good for a complete set of rookie autographs. The promotion is a little different from previous years. 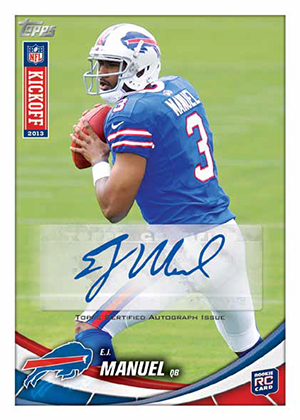 Last year, redemption cards were inserted in packs directing collectors to hobby shops during opening week. However, once the deadline passed, those that pulled a redemption were left with little recourse. 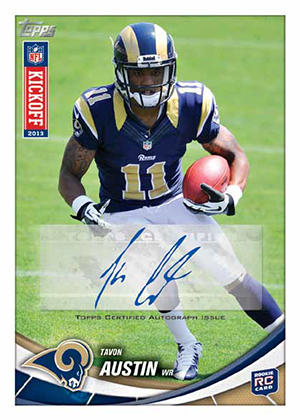 2013 Topps NFL Kickoff packs are available while supplies last. Click here for a list of participating shops. Please note this is an ongoing list. Where noted, print runs are confirmed. If a card doesn't have a serial number or note that it's a redemption, we're not totally sure it exists (though it looks as though the entire Kickoff set has autographs). We will be updating this list regularly. If you find one that we haven't confirmed yet, please feel free to let us know in the comments so we can add the info. wow thats a $36 pack. how meny cards per pack? steve � If I remember correctly, last year they were a one-per-box redemption card that was only good for one week. Not sure on cards per pack. dang, not one Ravens player in the bunch?? bit of a bummer. How many packs of the Jumbo do you have to buy to qualify for the Kickoff pack? Adam � Jumbos weren’t mentioned in the info. I wouldn’t be surprised if there’s some leeway at some of the shops. Best to check in with your local shop.